I've tried every sort of tactic. The cough, the sniff, the whistle, but nothing seems to work. I have yet to find a good way to alert another rider that I am about to catch and pass them on the trail. (There are a lot of begginer riders in Draper. It's a common place to catch and pass). Whenever I try to say (in my still small voice), "On your left" or "when you get a chance, I'm coming around" the rider usually experiences a violent, full body shake, followed immediately by a hot flash and almost crashes. It happens all the time. The rider has no clue I am coming up behind them and no matter how much noise I try to make to alert them of my presence, they never hear it. It's not until I actually say something that they hear me. Is it my voice? Do I sound like a serial killer? The thing is. I kind of look forward to seeing the reaction. It's funny as hell. It's like watching someone who thinks they are about to die. In the Sunderlage home (not our real home), we have a lot of bikes and a lot of pillows. I like bikes. My wife likes bikes but she likes pillows more. I'd estimate that we have about 35 pillows in our house at the moment. That works out to be 7 pillows per person in our home. (Dug, Rob, Eric, back me up here). I don't really care for pillows. I once spent 2 years on an island in the carribean and for the first six months, I used my towel as a pillow. You get my point. I like to mix it up and get a different bike every couple of years. Keep it fresh. I'm in the process of selling my geared mtn bike and my Rig so I can take the proceeds and get a nice new single speed (Note to bike MFG's: I am currently accepting offers). If I've done my math, I should have enough to put into the new bike and walk away with some change. Here's the thing. When I buy a bike, it requires me to sell a bike (in this case, two bikes) to pay for it. When we (and by we I mean my wife) decides we need new pillows, we go get new pillows without selling the old ones. We probably have a few hundred dollars worth of pillows that we don't use. That's a nice wheel set. Things are about to change. Ebay is about to get some new listings for some really nice, gently used pillows. We dared a guy from work to try and eat 2 "Take 10" cheeseburgers (that's 10 patties w/ cheese each for a total of 20 patties) and drink a gallon of milk in an hour and keep it down for an hour. At work, we have a training room where customers can come from all over the World to Orem Utah and be trained on our software. Just outside of that training room sits a table. 4 out of 5 days a week, this table is loaded with all kinds of food. Muffin tops from Kneaders, fruit, croissants, etc...And just above the table is a sign that reads "Food is for Customers Only". That's the rule. I like that rule. It's a good rule. I usually respect that rule. But on the days when I commute in by bike, that rule seems a little silly. This morning, the blueberry muffin tops looked too good to pass up. So I took one and ate in while hunched over in my cube. I disposed of the wrapper by placing it in the trash can in the empty cube next to mine. One more reason I really do like my job. I can be a dirt bag cyclist and eat free food. A cyclist has already climbed the North side of Suncrest and has then dropped the South side and has climbed half way to the top. If the wife of said cyclist drives by in her car and wants to "watch" said cyclist climb the rest of the mountain, how many minutes can said cyclist climb in his big ring up the mountain before his engine totally explodes? Notes: The wife is on her way to the gym and is wearing her work out top which looks really really good. The daughter is only 2 but already understands the significance of cycling. It's been 5 days since Leadville and ,before today, I hadn't been back on my bike. The extra sleep, and junk food as been way too good. But all things must come to an end. This morning I met Tony, Jon, Dave, Scott and Ryan for a ride up the Alpine Loop and into work. I was the only one wearing a pack. To make things as light as possible, I packed flip flops and a small hand towel instead of shoes and a normal size towel. It didn't seem to help. I almost pulled over to see if Seth (my 6 year old) had crawled into my pack before I left the house. It felt very heavy. My legs must still be in Leadville somewhere cuz they aren't with me. I felt like I was riding with both front and back brakes on. After a shower and a few sent emails, Dave and I borrowed a car and hit the local Kneaders for some all you can eat French Toast and a Diet Coke. 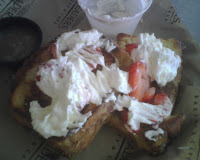 Their French Toast comes with amazing syrup AND real whipped cream and strawberries. Highly recommended but you might want to ride 40 miles and climb 3,500 vertical before you eat it. I'm feeling much better but still have the ride home to worry about. There is a lot of emotion at Leadville. It's a crazy event that can dish out a lot of suffering. It's not something you can explain unless you've done it. It's hard. It makes you dig deep. That's about all I can say. The night before. Making sure I have enough Gu's for 9 hours of racing. I brought home another Leadville 100 buckle but it wasn't the big one. My 2nd attempt at a sub 9 didn't go well. I finished the race in 9:21:11. About 10 min faster than last year but still shy of the sub 9. I knew that in order the break the 9 hour mark, I'd need to have the perfect day without any mechanicals. I had one mechanical and that was enough to smash my dreams. I felt pretty good most of the day and managed to work with Sam for the first 40 miles. It was nice to have a familiar face by my side for the first few hours. Once we got to the Twin Lakes feed zone, Sam would pedal away and ride his own race. He would eventually get his sub 9 on his very first Leadville race. It was a sick performance. I knew I needed to ride my own race and find a pace that worked for me so I didn't try to hang with Sam. I wanted to be sure I had enough in the tank for a strong finish. Columbine was as hard as I remember but the course was in better shape from all the rain. As I got close to the top, I started to see friends coming down. Chucky, Kenny, Sam, Brad. As I got the top, I was still on target for a sub 9 and feeling good. Rachelle loads up my pockets as I force down a banana and a few sips of Diet Coke at the Twin Lakes feed zone after climbing Columbine. I managed to stay on pace through the first 80 miles of the race and then it happened. The only time in my life that I've broken a chain and it happened about 3/4 the way up the Powerline climb. Snap. I looked down and saw my chain had split in half. I didn't have any tools or extra links to fix it but that wasn't the issue. I've never had to fix a chain before and really had no idea how to do it. I got lucky. I was riding close to Mike Lewis who saw my situation and asked if I had what I needed. I told him it didn't matter because I wasn't sure I would be able to fix it. He threw down a baggie with a chain tool and some extra links and said "figure it out" and kept on climbing. I got to work and managed to hack my way through it. I knew Brad was close behind me so I waited for him to catch and asked him to spot check my chain fix. He looked at it and gave me the green light. I climbed back on my bike and kept going. I had lost my motivation and knew that the time spent messing with my chain had killed my sub 9 dream. It was hard to find the motivation to ride hard after the chain issue. I was not in a good spot. the voices in my head were not helping and I still had the last part of Powerline to climb which seems to go on forever and ever. Brad and I kept each other in sight for the rest of the ride. We took turns being the carrot. I knew Brad was not having a good day. He had not been on his bike in 3 weeks and had considered not racing. We ended up crossing the line together. Both of us in pink (at least we didn't hold hands as we crossed the line). Dug would get his sub 11 on a single speed and so would Elden. 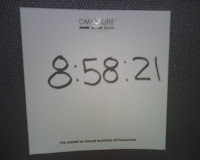 Sam got his sub 9. Kenny took 2nd in SS (8:30). Bob finished in under 11:30, Nick finished in under 11 (not his best but a solid finish). Special thanks to Rachelle for stuffing all the right things in my pockets, asking the right questions, the many pep talks along the way and for being such a hottie. How could I not keep riding knowing you were waiting for me at the finish? Here we are after the race ordering 5 large pizzas. It only took 2 hours. It's all mental. I decided to come up with a goal and get this time in my head. If (and that's a huge IF) I'm going to get a sub 9 at Leadville on Saturday, it's going to be really close. I've decided to give myself an extra 1:39 in case I crash with the finish line in site. I'm sure my legs will be cooked and I'll be sloppy and a crash is possible. Even if I'm going straight on a paved road. I've set my sprinklers to go off at 8:58 AM. Last night, I cooked my Lyn Wilson bean burrito for 8 minutes and 58 seconds. I'm pretty sure this is the best plan ever. "The CrossMark is the dramatic evolution of the cross country racing tire. The nearly continuous center ridge flies on hardpack, yet has enough spacing to grab wet roots and rocks. The slightly raised ridge of side knobs offers cornering precision never before seen on a tire this fast." Sounds like the perfect tire for Leadville. 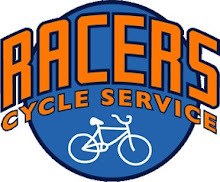 I had Racer slap these on my Niner and Stan's them up. My bike is ready. No more tinkering. It's almost show time.